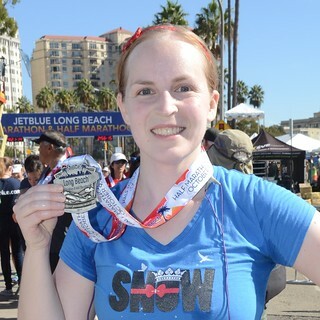 Today I ran the Long Beach Marathon. 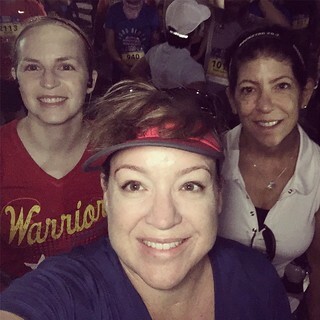 Marathon #4 for the year. I can’t say I was fast, and I can’t say it was all that enjoyable, but I crossed the finish line on my own two feet and that’s what really matters. I spent most of the last six miles hating running, races, myself, and basically everything else under the sun. And crying. There was a lot of crying. But when I rounded that last corner and the end was in sight (a very timely downhill stretch, thank goodness) I was incredibly proud of myself. This time it wasn’t pain or exhaustion or nausea that got me choked up, but knowing what a monumental accomplishment it was to run 26.2 miles and still be upright afterwards. (Granted, immediately after getting my medal I went to my running group’s tent and lay down flat on the grass for a few minutes. It was something I just had to do.) 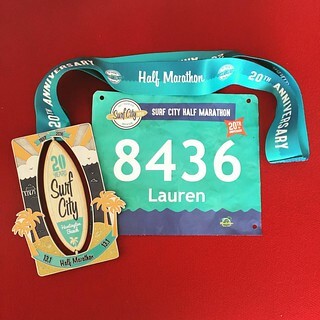 I know that marathons aren’t as much of challenge for everyone, and that a majority of runners finish at a faster and more consistent pace than I did, but as a good friend reminded me once, “Everyone gets the same medal at the end.” And I’ll cherish that medal because I had to work so hard to earn it. 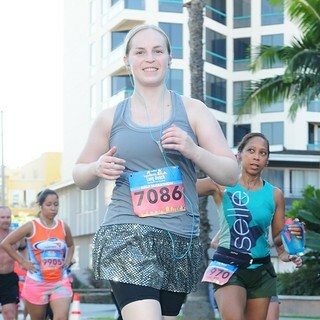 I run not so much because I love it, but because it’s a challenge. It’s certainly not an activity that comes easily to me. I struggle a lot (way more than I’d like to admit, actually), and I have to train very hard to be successful. 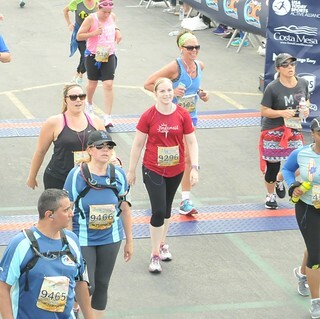 I redefine my goals every time I line up to start a race. Maybe I want to finish in a particular time, or maybe I want to run a comfortable, steady pace, or maybe I just want to have fun. I’m not competing with anyone but myself so I set the rules. It’s my life and I do whatever it takes to make myself happy. 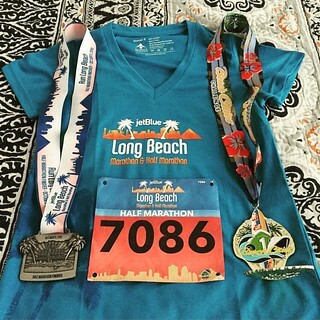 And tonight I’m happy because the Long Beach Marathon is behind me and I have the medal to prove it. P.S. My diet today included a lot of sugar. 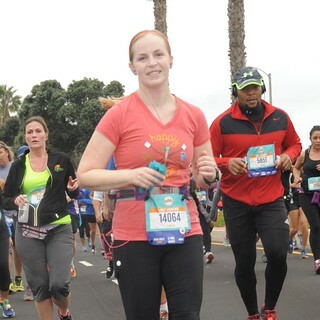 During the marathon I had Sports Beans (Jelly Belly has made my long runs so much tastier), Gu gels (new s’mores and toasted marshmallow flavors), and three 10-oz bottles of Pedialyte (apple, grape, and strawberry). I needed all of it to survive, even at my slow running pace. After I got home from the race I ate whatever I wanted during my marathon recovery. Now my stomach is all weird, though, so I’m looking forward to getting back on the healthy diet bandwagon tomorrow. Stay tuned for more super exciting news about my daily menus!